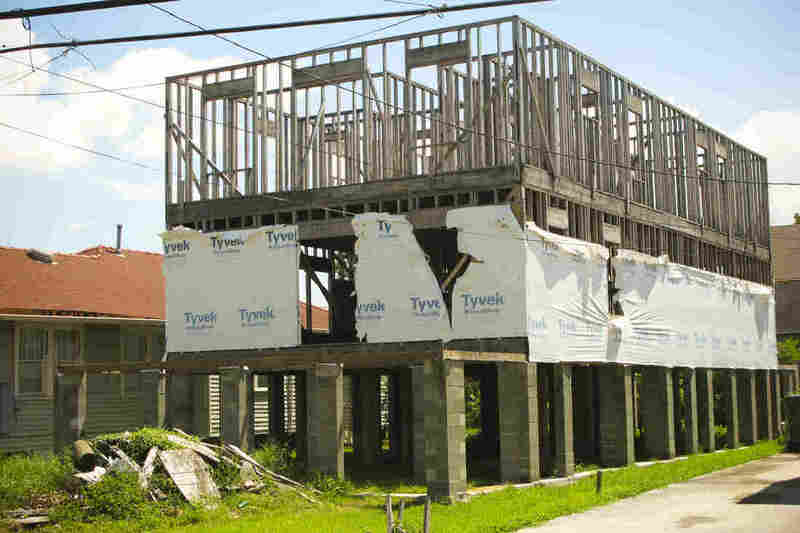 In Measuring Post-Katrina Recovery, A Racial Gap Emerges Ten years after Hurricane Katrina flooded New Orleans, much progress has been made to rebuild the city, but black and white residents assess the recovery quite differently. Large homes and lush lawns are common in Lake Forest Estates, a subdivision in New Orleans East. After Katrina, 6-foot-deep floodwaters devastated the region. How can you tell if a city has come back from a tragedy as devastating as Hurricane Katrina? Ten years after the levees failed in New Orleans, and the waters of Lake Pontchartrain, whipped up by Hurricane Katrina, flooded most of the city, New Orleans residents say there's been much progress since then. A new NPR/Kaiser Family Foundation poll found that a majority surveyed — 54 percent — says New Orleans has mostly recovered, measured by returning population, new housing, jobs, infrastructure and quality of life. Break the results down by race, however, and the numbers show a big gap. Just 44 percent of black New Orleanians think the city has come back. The number is much higher for white residents, at 70 percent. In the Broadmoor area, one of the most diverse in New Orleans, residents fought plans to turn a parcel of low-lying land into a park. Now a new library and community center at the site hosts classes, clubs and events. "This is one of the anchors the community worked really, really hard to rebuild and to renovate in the years after the storm," says Emily Wolf, director of the Broadmoor Improvement Association. 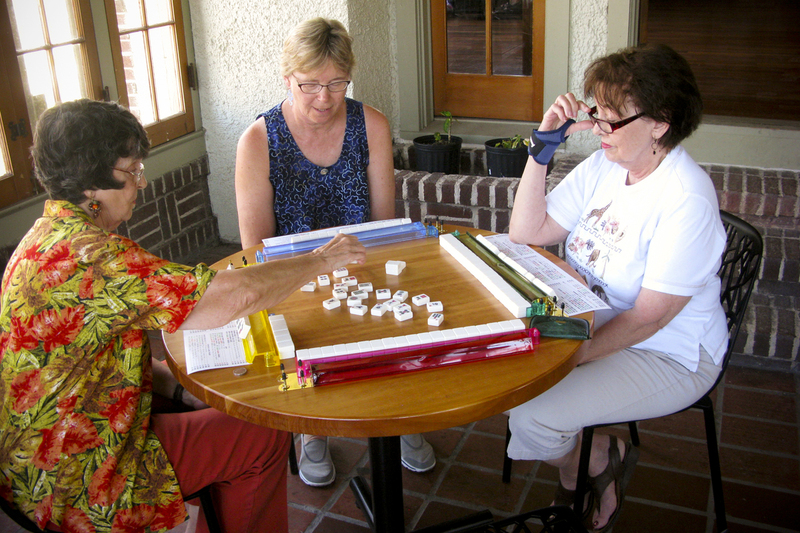 Cheri Babich (center) and her friends gather at the Broadmoor library for a weekly game of mahjong. Residents rallied to save the building after the low-lying area was designated to become a park in the aftermath of extensive Katrina-related flooding. On this day, a group of friends has come in to play its regularly scheduled game of mahjong. They're white, and one of them, Cheri Babich, is enthusiastic about the city's prospects. "Now we've got young people moving in here," Babich says. "There's new restaurants opening every week. It's just amazing. So many people are just bustling around and working. It's great." Some areas have more people and housing than even before Katrina. Mary Logsdon, who lives in one of those neighborhoods, says there's a bit of a downside to the boom. "Rents have gotten unbelievably high," Logsdon says. For many longtime residents, rents are unaffordable and they've had to move elsewhere. But two-thirds of whites and those with higher incomes say the recovery efforts have helped people like them, either some or a lot. 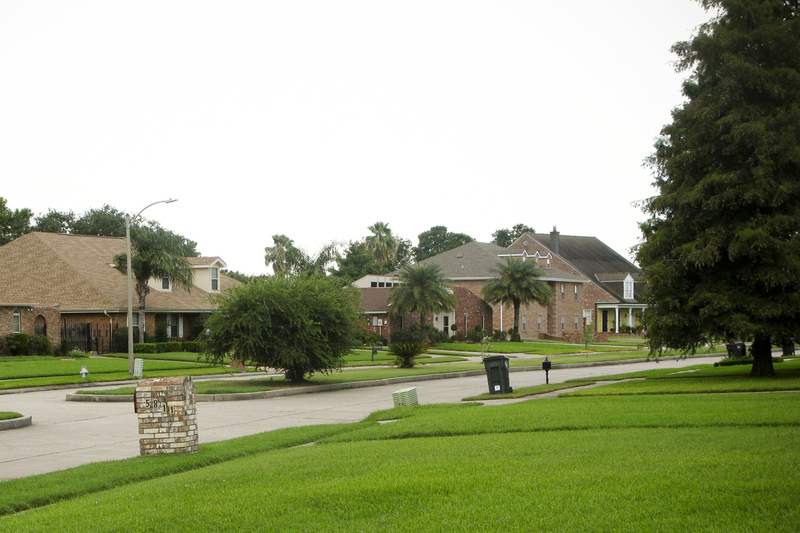 About 10 miles northeast of Broadmoor is the Lake Forest Estates subdivision, one of several neighborhoods in the New Orleans East region. Houses here are big, lawns expansive. 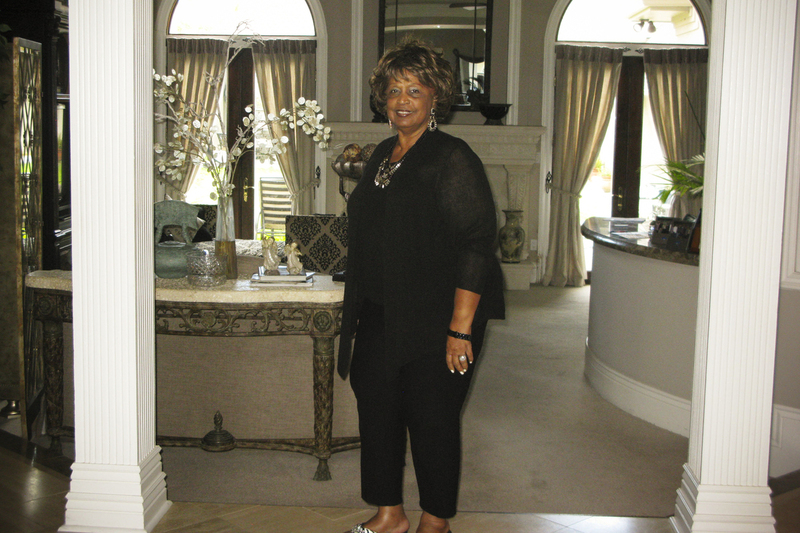 Realtor Sylvia Scineaux-Richard, a black former biology professor, describes this neighborhood as well-to-do. Realtor Sylvia Scineaux-Richard says residents of New Orleans East were among the first to return to repair flood-damaged homes. She doesn't expect full recovery for another five to 10 years. "You're not going to see a whole lot of blight in these areas here, because people had invested quite a bit of money in these homes, as you can see," Scineaux-Richard says. "These are not throw-away types of properties." Most of the homes here are occupied; in other areas of New Orleans East, not so much. One reason for the disparity is the way the rebuilding grants worked. The Louisiana Road Home program maxed out federal rebuilding money at a home's pre-Katrina value, meaning more money for wealthier homeowners and substantially less for those in poorer neighborhoods. Civil rights activists and homeowners filed suit, accusing the program of discrimination. A settlement eventually allowed homeowners to apply for additional funds. Scineaux-Richard says there should be more of a focus on New Orleans East. "New Orleans East deserves to have the rebirth here and the renovation as a priority, because we were so badly devastated and damaged," she says. Rehab work remains unfinished, even in communities like Broadmoor, where most of the housing is occupied 10 years after floodwaters submerged the area. About 5 miles from Scineaux-Richard's subdivision, where more homes sit abandoned, residents have an even greater sense that the recovery left them behind, particularly when it comes to employment. Sixty-six percent of whites in the NPR/Kaiser poll say New Orleans has good job opportunities for young people; only 35 percent of African-Americans say so. The prospects for young black residents are bleak, says promoter Johnny Conrad, 26. "Ain't no jobs out here," Conrad says. "Why you think they got people on the corner? Making money, man." Student Tooty Jones says connections are key. "It's all in who you know," says Jones, 26. "If you don't know nobody, you're going to struggle for the longest." Charles West, a city hall strategist who oversees a program designed to prepare people for job opportunities and match them with employers, says 52 percent of the black men in New Orleans are not working. "It is a major challenge for us to address the disparities and economic opportunity for our most disadvantaged, which in this city, in large part, are African-American men," West says. Several organizations are trying to shift those employment numbers, too. At Liberty's Kitchen, a workforce training program for 16- to 24-year-olds who are out of school and out of work, young barristas — mostly black — take coffee orders and prepare food. Jason Johnson trains at Liberty's Kitchen, a workforce development program for young people. Johnson hopes to open his own restaurant featuring live jazz. Jason Johnson says he's hopeful about the future. 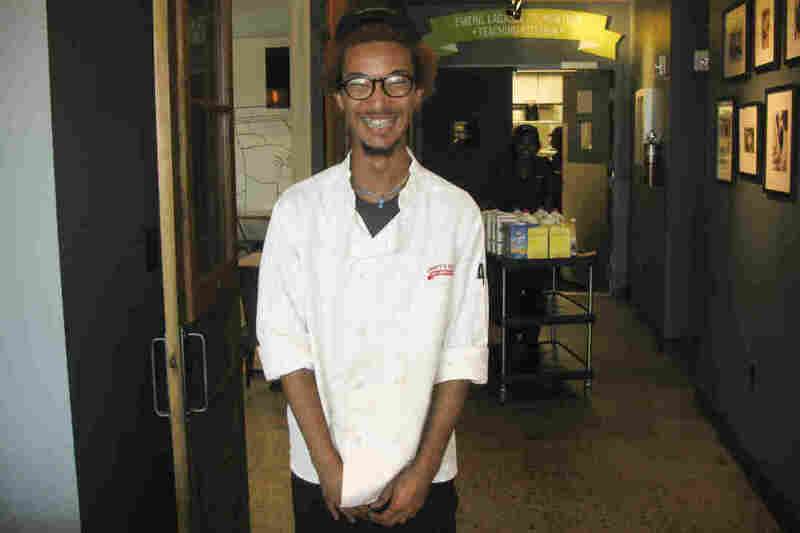 Johnson, 20, says the culinary skills he has learned here and the experience interacting with customers will help when he starts his own business. "I want to open a jazz club, to bring back the jazz culture around the world, to be honest, and have a place for artists and people in those types of fields to come and just have free expression of themselves," he says. 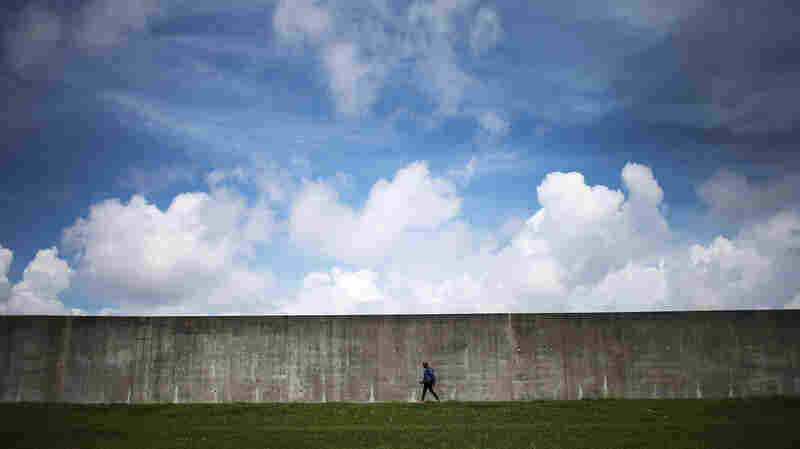 A woman walks along the rebuilt Industrial Canal levee wall in New Orleans' Lower Ninth Ward on May 18. Chondra Allen wants to own her own restaurant, too. "There's opportunities, but it may not be known," says Allen, 21. "That makes it difficult to actually get to them, because you're not sure what is out there for you to get." Liberty's Kitchen director David Emond says more millennials are moving to New Orleans than to any other city, and it's important that the young people already in the city be part of New Orleans' economic boom. "You can really argue that the most dramatic impact of the storm was on these kids who were torn out of schools, ripped away from families, moved to different cities, lost all of the networks that were there to support them and, in many cases, have never fully recovered," Emond says. And recovery is key, he says in a city with so many possibilities.